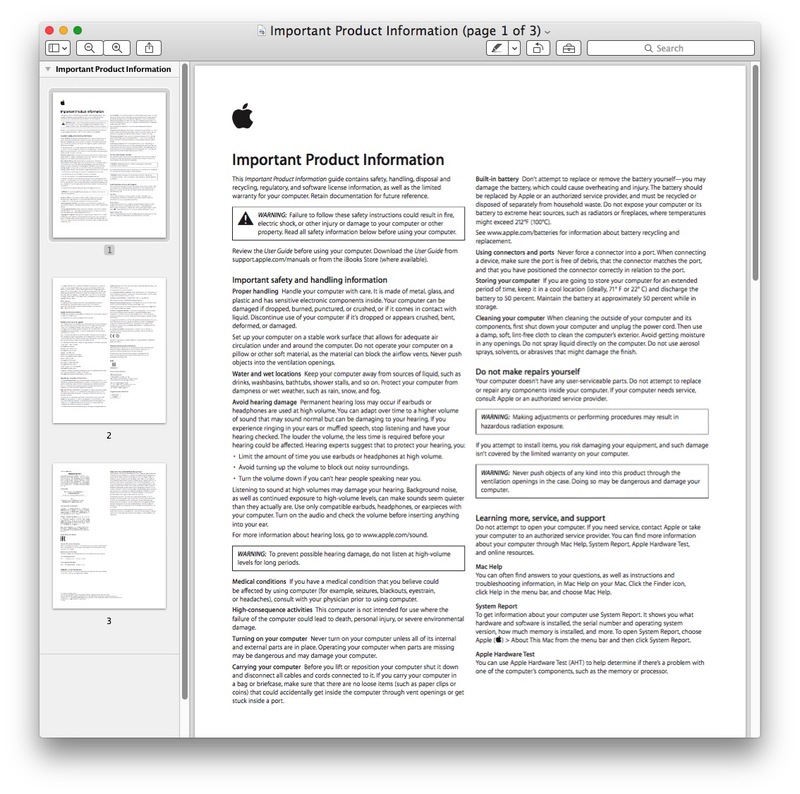 The Preview app on Mac opens PDF files and image documents, and also allows for the easiest way to search PDF files for contextual term matches on a Mac. Even better, Preview can search in PDF files for matches across multiple pages, and it actually highlights each match in bright yellow making it remarkably easy to quickly locate search matches within the PDF document. To be perfectly clear, we’re talking about searching within a PDF document for a term match, for example if you wanted to looking within a specific document for “key term”. 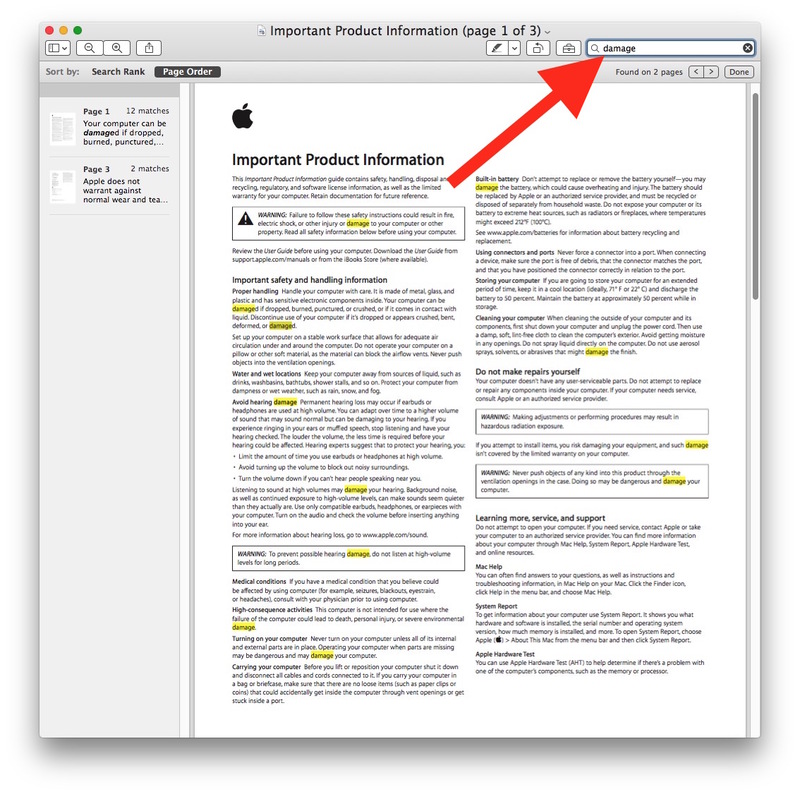 We are not talking about searching for PDF files on the Mac file system, though if you want to quickly locate PDF files on a Mac, the best way to do that would be to use Spotlight to find the specific file type match on the computer, which in this case would be “kind:pdf”, which effectively locates all PDF files on the Mac. Of course you could first locate a PDF file, then search within that opened PDF file for a matched term using the Preview trick outlined here. 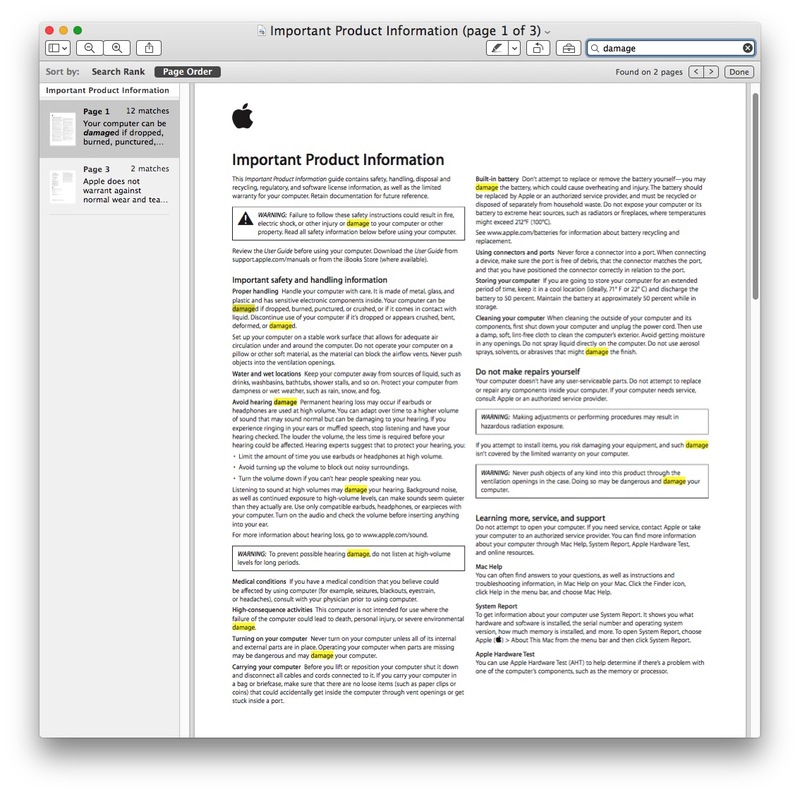 In the screenshot examples here, we’re searching a multi-page product info PDF file for the term for a specific term, and you’ll notice the matches are highlighted throughout the PDF file opened within Preview. * Preview is the default PDF viewer on the MacOS and Mac OS X, but if you have installed another app that has taken over as the default you can set the default PDF viewer back to Preview with this guide. Longtime Mac users will likely note the Command+F keystroke is also what can be used to search for files quickly within the Finder windows (separately from Spotlight), and search for matches in Safari and Chrome web browsers, and many other apps as well. 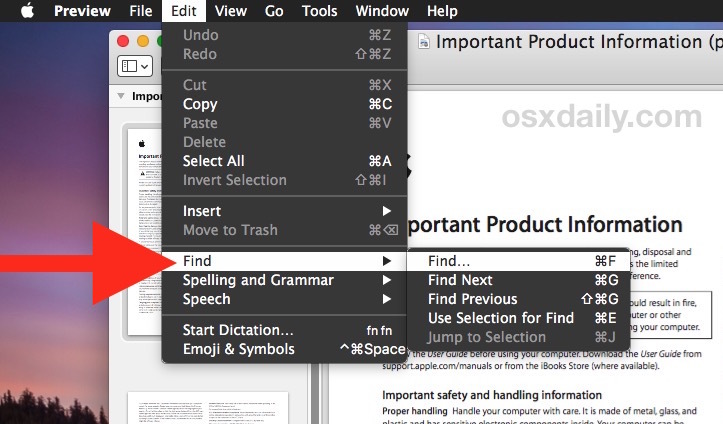 It’s a handy keystroke to remember as it works in many Mac apps as the Find keyboard shortcut. Find some but not all PDF’s can be searched. At this point I cannot work out the difference between those that can and those that cannot be searched with Preview. Any ideas? IF your pdf’s are scans and have not been converted to text then the search function won’t work. A scan is just a picture in a pdf, a bit map image. Some PDF files are simply sequences of images. Scanned books are often this way. You can get inexpensive utilities that will OCR and index PDF image files so that you can search them. I use PDFPen for that. Thanks George, that makes sense. I checked and that was the case for two recent ones. I suppose that explains why when I scan to PDF it goes into “Pictures” folder instead of onto the desktop as I had directed. Thanks. Your help is appreciated as my frustration level is now down a notch! If you have to tell your readers how to use the Search function, you must be writing this for idiots. My last visit here, as I am not one. Sorry you feel that way Gnuut. I am a new user of Macs and I find the articles very helpful and I found George’s reply clarified something that would have been difficult for me to figure out. Have a heart for the newcomers. We are the ones that help Apple grow! Gnuut I think if you’re leaving a comment like that rather than having the self control to ignore what isn’t relevant to you than you’re probably the biggest idiot on the internet. Life is one big microaggression to poor little Gnuuty, the all knowing wonder. Regarding Mr. Jensen’s criticism and his reference to idiots, I’m very appreciate of OSX Daily! As with Mr. Jensen, I know a lot already, but there’s a lot I don’t know…including things I don’t even think to ask about. Great way to learn. As for idiots…he reminds me of “Dummies” and all the great books written “for Dummies” that I don’t need, as well as one that I needed: my old copy of OS X Yosemite for Dummies! Even bright, smart, genius people are lacking knowledge in SOME area, and I find many of them (and us) to be more modest and polite than Mr. Jensen. P.S. : I hope Mr. Jensen doesn’t resort to name-calling if and when he has children, and he finds out how much THEY have to learn. Glad it’s your last visit! Who needs ya?? One glaring problem in Preview search is this: it cannot search for a phrase; it will search for all occurrences of all the words in the phrase. No, it does not work if you put quotation marks around the phrase. What’s more infuriating is that this used to work many years ago. I have complained to Apple numerous times about it but it does not appear they will address it since they now treat the Mac as a second class product. He seemed so sure of himself on that last bit. I have a pdf that is not searchable by mac os sierra preview program and I used Adobe Acrobat Reader DC for searching in it. Try it instead of Preview if you have a similar problem. I’ve only ever used acrobat pro xi or spotlight or houdahspot to search a pdf so It’s news to me that I could use preview as well. Thank you. I want to search a specific no. of pages (not intro, notes etc). Does anyone know whether you can bookmark specific pages. Currently, I’m trying to Index a book? in preview – select what page you want to bookmark and then go to the menu bar and choose tools and then bookmark and then to see what pages you have bookmarked go to view and choose bookmarks. You can either use the menu bar or the icon for view. After trying to search a pdf without success and realising it must have originated as a scan (from earlier posts) I used the export function to resave it as a new pdf. This was then searchable. Hooray. Thanks for the info that got me on my way ! My search for BK/PK in preview showed four pages as a result. In two of the four resulting pages the BK/PK text (it’s a wiring diagram) were listed in the result and highlighted in yellow on the page. The other two result pages gave me a beep (as in not-found) when I clicked on them. Huh? What’s with that? Then I put double-quote marks around “BK/PK” and the two pages (of the prior four) that had the highlighted found text were the only ones in the result. On closer inspection, the other two ‘beeping’ pages had PK/BK. Could that be an “interpretation” that maybe that’s a possible/suggested match – an alternate search term, like when google searching for a misspelled word: “showing results for received a gift, instead of recieved a gift, is shown? At least lately, with google search, it gives you results and shows words of the search that were not found (shown struck out) but maybe matched the rest of what you were searching for. Is there a way to do a case sensitive search in Preview? To me, this is one of the most basic features any search function should provide. Still I cannot find any option in Preview for performing a case sensitive search.